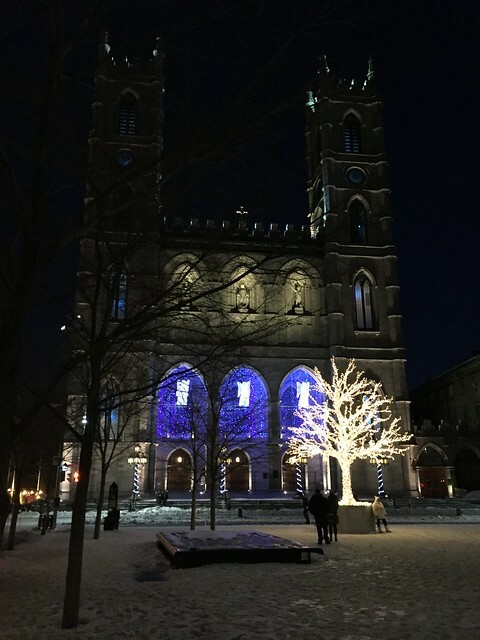 It's always nice to wander around Old Montreal at night - even in the cold with icy sidewalks. 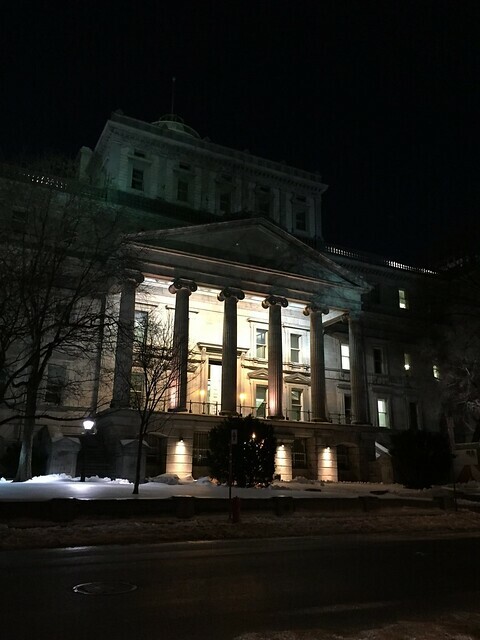 Buildings are carefully lit to show off their architectural details. You can barely see the spires of Notre-Dame Church. While the lights cast a warm glow, you could here the crunch of the brittle ice laced snow under my feet. Columns give a feel of solidity to a number of buildings in the area. They were built to feel imposing, to make a statement about the seriousness of what took place inside: banks, court houses, city hall. 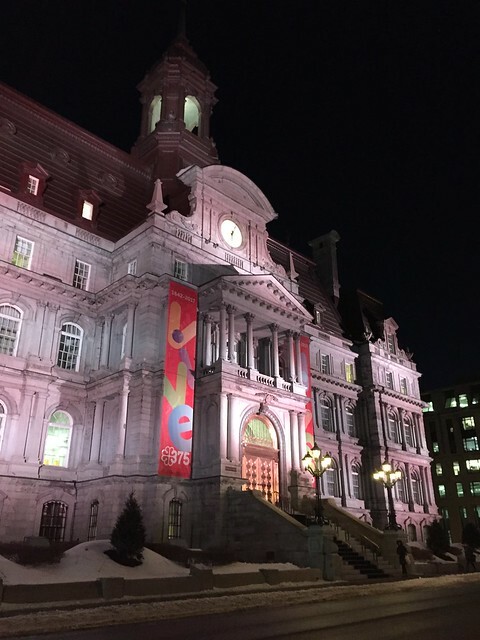 City Hall is decked out to celebrate 375 years since the founding of the city. It seems to me an odd number to celebrate but there are many projects and festivities planned. 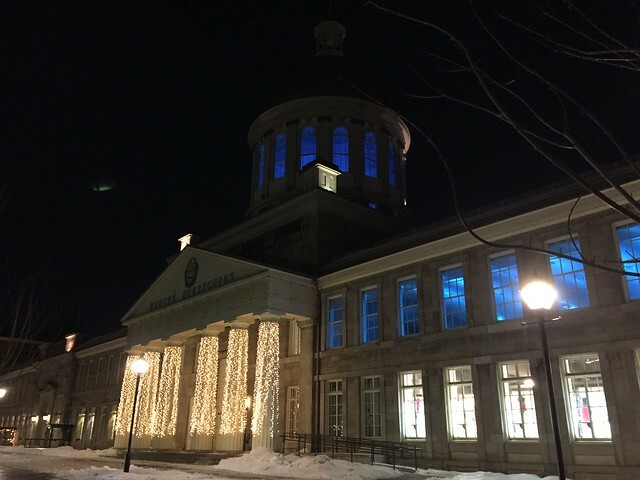 Bonsecours Market shows off its winter lighting. The restaurant we had hoped to eat at there, before a concert, was unexpectedly closed. We found another across the street and then strolled the short way to hear Barthold Kuijken and Mika Putterman playing baroque and classical flutes. What a wonderful concert!!! I can feel the cold aiir and hear the sounds as you walked, Susan. Great night shots of the imposing buildings. Do you use Yaktrax for your walking shoes? I always wear mine when walking on slippery winter pavements. 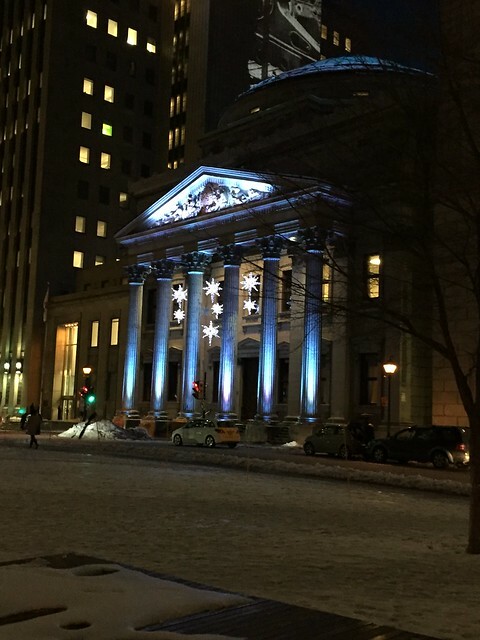 Old Montreal at night looks so fascinating. I like it when the imposing buildings are lit up in a refined way.